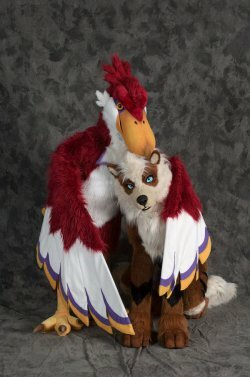 Racked, an online fashion magazine, has just published a particularly good illustrated article on fursuits; their history, the people who make them, and the furry fans who wear them. It's the freakin’ weekend. A blessing of rainbow unicorns dance around you. Your heart bursts with joy at the sight of a dairy cow and an otter gingerly embracing. Sweat drips down your face. You remove your head and wipe the sparkling droplets away with the back of your cerulean paw. A rabbit wearing paisley suspenders invites you to hop with him in a circle. You radiate happiness inside and out. You are not dead. You are not on acid. You are at a furry convention. Each year, dignified professionals from every major industry cast off their business casual, zip up their fursuits, and flock to furry events around the world. According to Furry Hall of Fame inductee and historian, Fred Patten, 74, the term "fursuit" was originally coined in 1993 by former Midwest Furfest chairman Robert C. King to describe full-body anthropomorphic animal costumes worn to conventions. I counted 44 highlighted weblinks in this article, many of which lead to other articles with more weblinks. You can spend hours reading this and going to all the weblinks. I could've done without NeonBunny's quote that, ""'There are now plenty of straight people in the furry fandom, and everyone loves and accepts them for who they are,' said NeonBunny." As someone who's been in furry fandom since the 1980s, I can say as "I was there" that furry fandom was predominantly straight for at least a decade before all the "non-straights" poured in. The main difference between furry culture and general culture "back then" was that furry fans were, if not enthusiastically welcoming to gays, lesbians, and bi's, at least more "so who really cares?" than the average mundane. What's this about accepting straight people "as they are"? It's political correctness gone mad! I wonder if the quote is out of context because there might be joking irony in it. Anyways, at my site is a super long interview with Neonbunny, that asks how he started the furry dance party, Frolic. It's at a gay bar but attracts lots of straight people and very subculture inspired. Makes sense from that. In 10 years, if the independent furry club thing keeps growing, it might make it's own "I was there then" story. "If people would treat furries as hobbyists instead of fetishists in public and the media then the furry fandom could be rightfully integrated as a respectable member of mainstream culture, like trekkies or otakus. At the moment the fandom is a feared, misunderstood freak show in the eyes of the public and I want that to change in my lifetime." I guess I'm confused as to why it matters whether it was predominately straight/gay/lesbian/cis/trans...like honestly who gives a flying feather? How does someone even bring that up casually without coming across as offensive or implying a stereotype? Great article. Sydney previously got introduced to furries by covering how they loved the Furry Force animation, for comedy industry magazine Splitsider. I liked talking to her, very cool to see smart writing about inside fandom topics that go beyond commonplace "here's what furries are" exercises.